New information suggests clearly that an acoustic torpedo fired by a U-boat caused damage and fatalities! Carl 0. Pfannkch ex-CRM IJSCG LST 327 After 55 years of being under the impression that the first Coast Guard manned LST 327 suffered a serious explosion off the Normandy Coast, killing 21 and seriously wounding 26 others, was caused by a mine, a new and astounding revelation is now being considered!A U-Boat had attacked it with a acoustic torpedo. 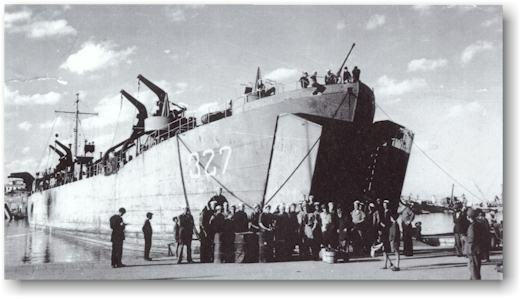 On August 27, 1944 at about 2000 hours the LST 327 on its 13th trip to the Normandy beachheads, to supply some of the troops that the 327 had brought in weeks prior, a tremendous explosion rocked the ship directly under the crew's quarters.Because a ammunition magazine storage area was located directly under the crew's quarters, the explosion was amplified by both the powder charges in the then thought mine and the ammunition stored in the lockers below the crew's living quarters. The 327 was in a convoy of LST's leaving the Normandy beachhead together with conventional vessels.She was the last in line. "2010. muffled explosion heard off our starboard quarter, concussion felt aboard ship, assumed to be an exploding mine.We were approximately 2OO yards ahead. Smoke seen rising from the stern of LST 327 Visual and radio message from LST 327 that she had struck a mine.This vessel swinging to port and proceeding to render assistance to LST 327. Port and starboard running boats lowered into water with rescue parties.Nets rigged over side." The log proceeds to describe rescue efforts that her boats, and others launched from the 327 were picking up survivors and that lines were rigged to the 327 alongside now, and towing her to the Needles.Men in the water were being taken aboard, injured were being cared for.Art Rosenstein was the radioman on watch aboard the 327, at the time of the explosion and he along with Lt.Jack Spelman were instrumental with quick efforts to obtain assistance. It was evening, a little after 8 PM, a good many of the crew had just been relieved and were turning in for a while as they were on underway watch, i.e. 4 hours on and 4 hours off. The double explosion, just tore the stern apart. Those men standing on the stem for a last smoke or gabfest before retiring were actually catapulted into the water, most of them sustaining broken arms or legs just from the sheer force of the impact. Acts of courage were instantaneous, boats were lowered in the darkness, rescue attempts were made, confusion reigned.Many men were picked out of the water seriously missing extremities, but holding on to one another for assistance.The destruction was all encompassing everything at the stem. The galley which was directly above the crew's quarters was destroyed also.The baker, at that time Tom Redmond had just put 240 loaves of bread into the oven for baking.Today, years later he complains of the loss of his bread.But, he seldom mentions his leg that was torn off by the explosion. Rescuing ships helped take the horribly wounded to facilities better able to handle the casualties. 21 men were killed outright with 26 others seriously wounded with broken backs, lost limbs and internal injuries. Chief Pfannkuch after the war and with the advent of computers and the Internet, put together a 12 page website delineating his peace-time and war time service. Included was a very lengthy verbal and pictorial report of the USCG LST 327.It's invasions at: North Africa, Sicily, Anzio, Nettuno and Normandy. The website has already had over 2000 hits, Many very interesting.Startling was the one Chief Pfannkuch received on October 4, 2000.It was from a Doctor in Germany, obviously a WW2 historical buff, that stated categorically, that the LST 327 had not struck a mine, but had been made a casualty by a U-boat.The complete text of the e mail message is attached hereto. I very much enjoyed your site.I would like to add for your information that LST 327 was not hit by a mine but was torpedoed by the German U-boat U 92 (CO Kapitanleutnant Engel).According to its war diary the boat fired a single acoustic torpedo (known also as Gnat or T5) at 2001 German Summer Time, equal to Gmt)/27 on the last LST in a convoy of several steamers and LSTS.The attack took place in German naval square BE3189 (equals approximately 50 09/01.35w). While the boat went deep after the shot a detonation was heard after 8 minutes 40 seconds.Going back on periscope depth one vessel was seen deep in the water.The CO assumed one LST with 3000 tons sunk and reported likewise to U-boat Command. The attack is listed in the book "Jurgen Rohwer, Axis submarine successes during 1939-1945" published in a revised edition recently by the Naval Institute Press Annapolis. However, the target was not identified by him.The place and time nevertheless clearly indicates that the target was LST 327. U 92 was put out of commission on 12 October 1944 owing to its bad technical condition after returning to Drontheim/Norway. After reading this e mails startling news that what we had understood for 55 years could be totally different than the facts, research began. The writer has access to many members of the ex crew of the 327, due to his search and contacts with 32 of them in the past.Available to question were the Officer of the Deck at the time of the explosion, also the Officer of the Day.Both in telephone conversations heard with amazement the facts related by the log of U92.Both, felt it could have happened in this manner, as the explosion was immediate with no warnings from lookouts. The fact that the times of the U boats log of the launching of the torpedo, the time element in the explosion heard by them, the degrees of latitude and longitude and all the timely fashions give much credence to the U Boat's Captain' report to the German U Boat Command. Further the fact that a notation in a publication "Jurgen Rohwer's "Axis Submarine Successes during 1939-1945 (revised edition recently by the Naval Institute Press Annapolis) substantiates that this attack did happen, at a time and place noted exactly where the LST327 was involved in an explosion. Further discussions with members of the crew at this present time, only substantiates the fact that it was assumed a mine was the cause of the explosion.The Officer of the Deck questioned, was amazed at the findings that a U Boat was the cause of the explosion, but stated "He always wondered how a mine could have traveled along the 326 feet of the length of the ship to explode at the stem"
There are many questions unanswered, but, time will reveal them as this information has been revealed.But, the official notation of the U Boat's commander attack, specifying the exact spot, the exact time, and the sighting of the LST's and ships at this spot in the ocean, lends much credence to this theory! It is a paradox, to find out after all these 55+ years, that we had not been taken out of duty after 5 major invasions and follow-ups by a mine, but by a U-Boat's Torpedo! God Bless the Souls lost and those that were stigmatized by this enemy action!